Mr. Aqeel! Ahmed Sajid (BS.19), Principal, Govt. Boys Model Secondary School, Khanpur, R. Y. Khan. Principal, Quaid.e.Azam Academy for Educational Development, Khanpur, Rahim Yar Khan. Mst Mah Jabeen (BS-19). Principal, Govt. 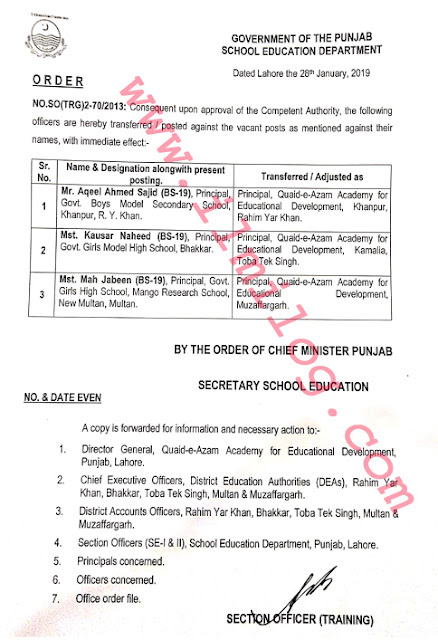 Girls High School, Mango Research School, New Multan, Kilian. Principal. Quaid.e.Azam Academy for Educational Development Muzaffargarh.